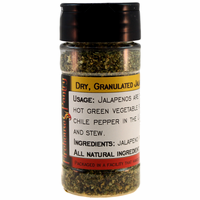 Jalapenos are thick-fleshed peppers with a hot green vegetable flavor. They are the most widely used chile pepper in the U.S. Add these tiny pieces of granulated dried peppers to salsa, chili, soup and stews. Stores and travels well - shelf-stable - great for emergency food supplies, camping, boating, and RVing. Volume: 1 pound = approx. 5.19 cups. Ingredients: jalapeno pepper. Packaged in a facility that also packages wheat, milk, soy, egg, peanuts, and tree nuts. 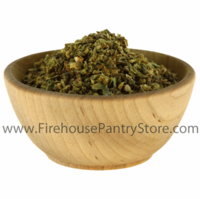 We use this in our Smoked Cheddar Jalapeno Spread Mix.